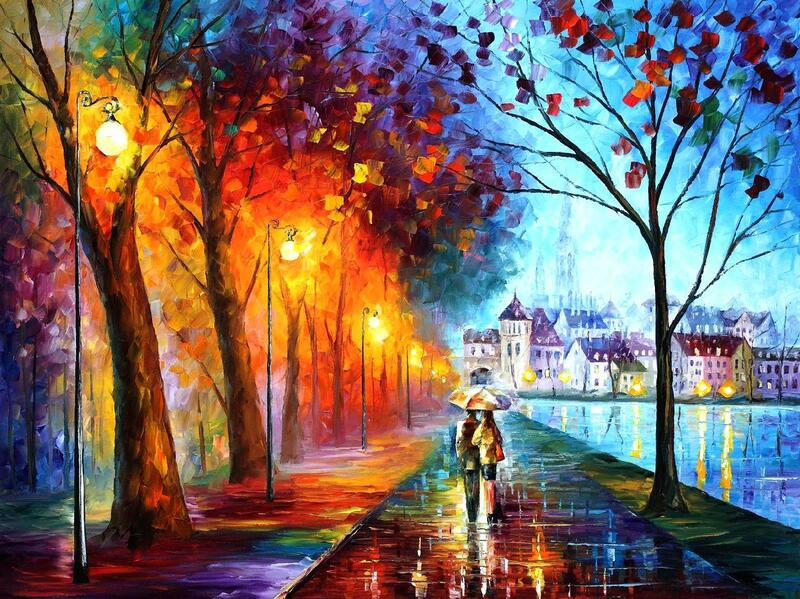 On today's edition of Artist Spotlight, we're going to take a look at the work of a modern day Impressionist, Leonid Afremov. He has a remarkable body of work, and he also manages to market himself completely outside of the typical gallery establishment that boosts so many artists. But first, let's take a look at his work! He paints primarily in oils, but he throws a bit of a twist into the mix by forsaking paint brushes in favour of a palette knife. Originally used (as the name would suggest) as a knife / trowel for mixing paints on an artist's palette board, the advent of modern premixed paints left these tools in a rather unique state of limbo. Virtually every painter had them in their paint boxes, but they no longer needed them for their intended purpose - so many artists began to experiment with using them in place of paintbrushes. This wasn't the first time that anyone had tried it, but it certainly helped to popularise the technique. Afremov takes the palette knife and uses it with his oils to great effect, as it is such a versatile tool. He can create the smoothest of gradients or the classical extra-visible strokes that exemplify the Impressionist style. He focuses primarily on the interplay of light and colour, and manages to create some truly breathtaking images out of relatively mundane cityscapes, as you can see from the example on the right. One of the more surprising things about Afremov is that he refuses to work with any galleries or agents, and instead does all of his own self-promotion using the internet. He manages to make his entire living this way, and it's possible to buy original oil paintings from him for far less than you would expect. This is a remarkable feat for any artist, and how thoroughly he has embraced the marketing power of the internet is even more remarkable when you consider the fact that he was born in 1955 in what is now Belarus. Curiously enough, he was actually born in the same town as Marc Chagall, who was one of the artists responsible for popularising the use of the palette knife in the modern era. Chagall became a huge inspiration to Afremov, and helped to shape his unique and beautiful style. After a brief stint in Israel and Europe, he moved to New York but later abandoned it for the Caribbean shores of Mexico, where he now lives and paints full-time.